Have a wet and thrilling summer with the Windsor 2 Slide and Splash. 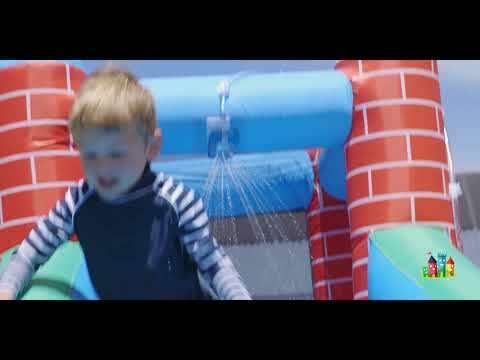 Part jumping castle, part water park, the Windsor 2 has a huge 3m slide and climbing wall. Stay cool in the hot season with a splash pool and built in water turret. Windsor 2 is a large sized and comes with ample room for up to 4 kids. For all the little thrill seekers, Windsor 2 comes with a 3.0m slide for some climb and slide action. Windsor 2 comes with an electric air pump to keep your castle inflated during play. Windsor 2 comes with double stitching and heavy duty puncture proof materials for maximum durability. Windsor 2 is designed for water-play - cool off in summer or any time with our built-in water-turret. Simply hook on a garden water hose to the turret for awesome super soaking fun.